Hello. I check by self, more info about CHCP command. Reading the MSDN I found that in CONSOLE there are a two code pages: For the INPUT and for the OUTPUT. 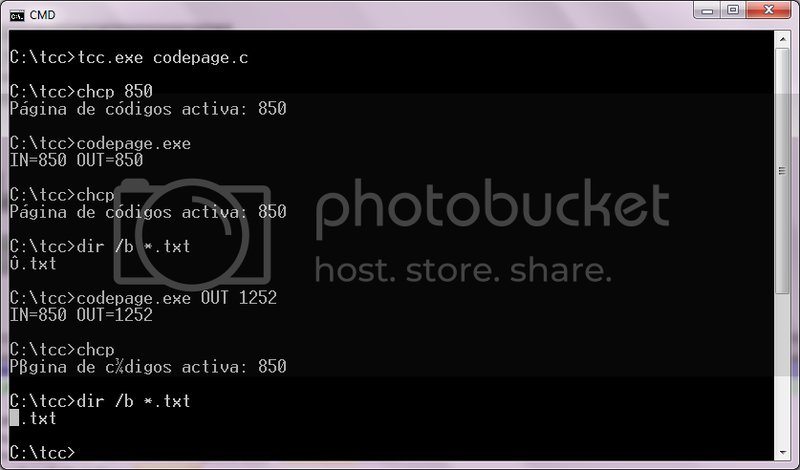 Then, when you call to CHCP and provide a valid CODEPAGE, this utility set the same codepage for both: INPUT and OUTPUT. But, when you call the CHCP command, chcp print the codepage of the INPUT assuming that it is the same of the OUPUT. I write a little program in c for change the codepage of both. You can compile with tiny c for use it. In this example, first we set input and output codepage to 437, and after set the output codepage to 850. As commented in previous post chcp show the input codepage. graftabl show the output codepage. graftabl only set the output codepage, chcp set input and output codepage. It is available in windows 7 pro. c:\Windows\System32\graftabl.com in Win 8 32 bit. Maybe yours is 64 bit. Yes.My both machines (7&Vista) are 64b. None of them have the command. This should help with 64 bit machines.